Spiders are found everywhere from blazing deserts to freezing climes, exhibiting extreme resilience, adaptability and unique survival mechanisms. It is no wonder that they endured calamities and are historically older than dinosaurs. Broadly, spiders are divided into two categories: Mygalomorphs or big spiders and Arnaeomorphs or small spiders (often only a few millimeters in length). India is home to several unique species of spiders — some are known to science, while many others are yet to be discovered. According to an estimate, India is home to 59 families of spiders. Although spiders are often discussed based on their regional distribution – such as South Indian spiders and so on, they are not bound by these territories and can be found all over. Despite their widespread presence, spiders are poorly studied. Very few known records of their natural history exist— not only of those found in the wilderness but of many commonly seen spiders found in homes, parks and backyards. “Most descriptions are based on preserved specimen. Field studies based on a living specimen collected and observed from the field enable easy identification. There is an urgent need to record their behavioural patterns and natural history,” said Javed Ahmed, an Arachnologist and an independent researcher who, along with his group is credited with discovering several rare small spiders. Spiders use camouflage for hunting and escaping predation. For example, Eriovixia gryffindori is a rare species found in the dense Kans forests of Karnataka. The 7 mm brown-black female spider was found masked among dry foliage. Found in the same forestlands, Paraplectana rajashree is a unique spider species which mimics beetles in appearance and effortlessly merges amidst them. The coloured appearance protects it from predators while it survives on the abundant food source around. Cyrtarachne sunjoymongai is another rare spider discovered here that resorts to mimicking snails to blend into its marshy surroundings. Spiders spin webs using thin threads of silk from their spinnerets, which are comparable to Kevlar in strength. From a few obscure strands to orbs to giant nets, spider webs come in a variety of shapes and sizes. The webs play different roles – to reside, retreat or to capture prey. 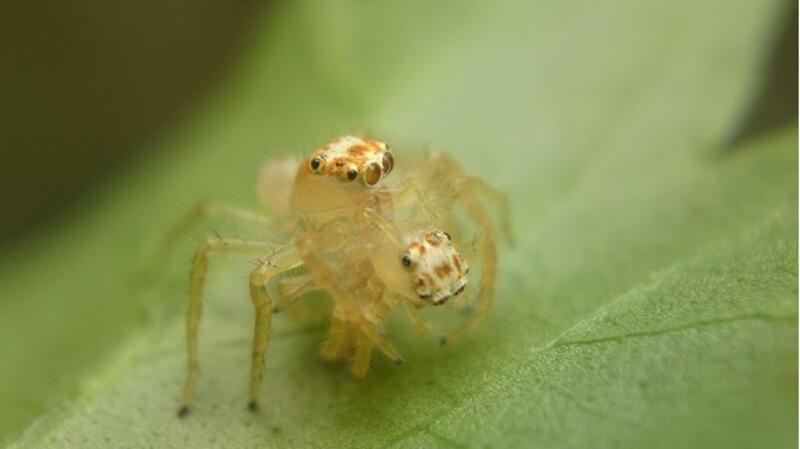 In a recent study of a commonly found jumping spider Telamonia dimidiata— recognisable by its distinctive two stripes on its back — Indian researchers have discovered a strange behaviour. This spider constructed a different web each night for three consecutive nights. “It is a cursorial hunter and does not use the web for hunting. Instead, it uses it as a resting ground to revisit, depending on whether it was disturbed or not,” explained Ahmed. Spiders are voracious eaters preying and consuming a variety of insects. They are capable of preying on insects many times their size, as exhibited by T dimidiata which devours dragonflies! Spiders hunt their preys and inject venom into them to immobilise the prey before eating them. In one study by the group, a tiny jumping spider belonging to the Hasariini tribe hunted a tadpole upon a slippery cliff slope which had seasonal streamlets; it then dragged the kill uphill towards a muddy patch to eat it. Another study published in journal The Science of Nature indicates that spiders consume an estimated 400-800 metric tonnes of insects annually and play a critical role in the ecosystem. They often act as domestic, agri-based and environmental pest controllers. In this endeavour, spiders exhibit unique tactics to attack their prey. Spiders are skilled hunters using venom to kill their prey. While a spider web is itself a trap, some spiders utilise their silk in unique ways as a study of Dictis mumbaienis has revealed. On spotting a prey, the blue-brown huntsmen tribe spitting spider makes a preliminary run to gauge the distance, runs back and then spits out a venom-coated silk thread like a lasso on the insect, immobilising it. Then, it injects a final dose of venom and polishes off the meal. Jumping spiders take advantage of their remarkable orientation capability. They employ gravity assistance and uses the silk like a dragline. The calculations are bafflingly accurate before the spider pounces upon its victim to gobble it up. Despite diverse meal options, many spider species unhesitatingly gobble up their own like, exhibiting spider cannibalism, known as araneophagy. The recent study revealed that T dimidiata also exhibits cannibalism, and, the hunter, in turn, became the hunted to another spider species. However, the study recorded an interesting observation while it was being eaten: “Though T dimidiata gradually lost all mobility, it still retained its ability to scan around with its anterior medial eyes. This unusual behaviour suggests that the nerves and muscles of the spider are more resistant to the toxins in the venom,” said Ahmed. Despite such marvelous survival methods, spiders are rarely pose any danger to humans. In fact, it is the other way around. “We have busted an internet hoax around T dimidiata,” said Dr Krishna Mohan, another team member. “We must acknowledge that as lower order life forms, spiders are cogs in the wheel of the ecosystem. Any disruption to their habitats can bring the entire system crumbling down,” avers Ahmed.